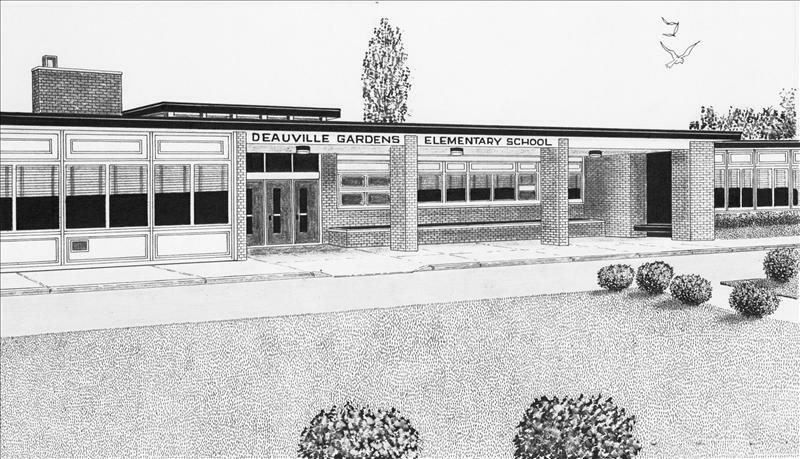 Deauville Gardens East Elementary School serves approximately 450 students from kindergarten through grade five and provides a variety of experiences to support the social, emotional and academic well-being of students. The collaborative atmosphere, well-trained and highly qualified staff and student-centered philosophy foster an environment which truly benefits children. In order to provide a meaningful and effective education, maximize student growth and meet the requirements of the Common Core Standards, a variety of programs and approaches are utilized. Guided Reading is the foundation of the Balanced Literacy program that is embraced in order to challenge each individual student at his or her appropriate level. Math is taught by allowing students to experiment with concepts and create their own understanding of material. In addition, a number of after-school programs and clubs present students with opportunities to explore new interests. At Deauville Gardens East, we recognize that a strong partnership between the school and home is essential for a positive and productive educational experience. Staff members work closely with the PTA and families to provide enriching experiences for students both inside and outside of the classroom. Student-artists at Deauville Gardens East Elementary School were featured during an art show in the school’s gymnasium on April 3. Deauville Gardens East students in Jodi Embleton’s art classes showed off their work prior to the school’s Parent-Teacher Association meeting. All grades participated in the show, which also highlighted the artists’ 3D displays. Members of the Walter G. O’Connell Copiague High School Tri-M Music Honor Society provided a backdrop of music for the evening. After completing their science unit on the parts of the plant, fourth-graders at Deauville Gardens East Elementary School participated in a two-day experiment to show the workings of vascular plants. Using stalks of celery, the students placed the plants in colored water to observe the way the celery absorbs water and transports it through its stem. After making their initial hypotheses, the students recorded the changes in the coloration of the celery on day one and day two. Fourth-graders in Jennifer Kelly’s class at Deauville Gardens East Elementary School recently completed science research projects on the different types of energy. After making flip books filled with facts and illustrations, the students created Google Slide presentations to share with the class. Fourth-graders in Mrs. Kelly’s class at Deauville Gardens East Elementary School have been researching animal adaptations as part of their plant and animal structures unit in science. Students researched their favorite animal using technology and library resources. They organized their information and published their research projects to be included in their nonfiction anthologies. The members of the student government club at Deauville Gardens East Elementary School teamed up with the members of the art club to help recognize the unsung heroes in their school community. The art club made origami gift boxes and filled them with a few sweet treats and candies. Working together with the student government, they created thank-you cards for the silent heroes of the school – custodians, nurses, cafeteria staff, security guards and secretaries. They delivered their sweet treats – along with a smile – around the school at the end of January.